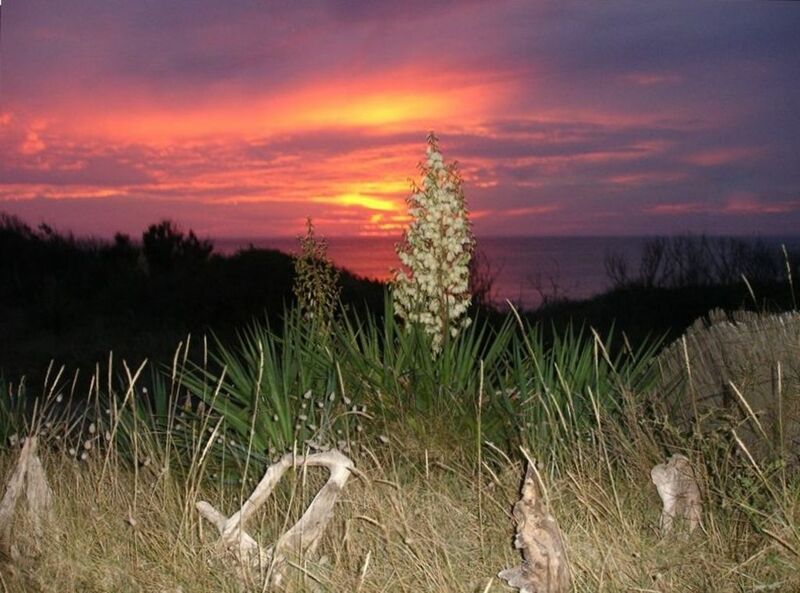 I wanted a quiet natural unobstructed view of a sand dune, wildflowers, sandy beach, and a fantastic view of the Atlantic Ocean to see the superb sunsets from the terrace while dining late into the evening. Each evening the setting sun paints a Monet-like painting every few minutes to beguile. This is my place to retreat to, to relax, write, walk along the beach, the dunes and the forests, to swim, to cycle and to enjoy the sun while basking on the terrace or out on the sandy beach 40 meters from the house. This is after all one of the sunniest spots in France. I wanted too a place from which I could easily go to visit the wine Chateaux of the Médoc, Graves, Saint-Emilion, Pomerol and Sauternes, to taste great wines and to make new friends. For culture and extensive shopping, there is Bordeaux (100 Km), a miniature Paris, and Saint-Emilion (140 Km), the prettiest town in France. And of course, each nearby town and village has its festivals and market days. The weather is mostly dry warm and sunny. The wine is superb and the food exquisite. A fisherman's wharf is 15 Km away where the daily catch can be purchased. One can eat and drink so well in France. And then, there is that magnificent view, the Atlantic Ocean swells visible by moonlight from the bedroom window and from the terrace while breakfasting or dining out with the sunsetting in the background. It is incredible that this place on a sand dune overlooking the Atlantic Ocean is mine, but I am willing to share it with you. And if you wish, I will advise you and help to make appointments on visiting the Wine Chateaux of Bordeaux. For larger groups of family or friends, it is possible to rent my place next door so that up to 8 people can be accommodated. Keywords: Townhouse on a dune overlooking the Atlantic Ocean and sandy beach. I am a wine journalist and wine consultant who obviously enjoys visiting the great Bordeaux wine Chateaux and tasting their fabulous wines. I was born in Holland and spend my summers at the sea side on the North Sea coast. The dunes, beaches, pine forests around Amelie remind me of the coast of Holland but the weather is much more sunny and average temperatures are about 15 degrees warmer. The nearby wine regions of Bordeaux led me to visiting Amelie in 1989 and I fell in love with the place where there is enough space to get away from the crowd if you want to by simply walking further down the beach. Of course, our terrace is very private and sufficiently secluded from other people. Amelie is one of the sunniest spots in France with even many sunny days during the mild winters. Temperatures in the 20 degrees Centigrade can occur between mid-March and end of October. The ocean air is so pure so that allergy sufferers like me can enjoy breathing freely and sleeping well to the soothing sound of the waves. Gourmets can enjoy great fresh foods available in the local supermarket or local farmers and fisherman's markets and of course great Bordeaux wines. situated on a dune overlooking part of beach and the Atlantic Ocean. About 40 meters from the Beach but to preserve the Dune area, access to the beach is by way of the road access to the beach by the campground about 100 meters away or way of the village. Spectacular view of the Atlantic Ocean with ever changing Monet like sun sets over the Ocean sky. Cost free telephone within Western Europe and to and from North America to normal no user fee telephone numbers. Charges are applied to calls to cellphones. Clothes dry in the sun and the wind breezes within one to two hours on the Clothes Line along side of the house. We had wonderful holidays in a beautiful area: a calm spot right on the ocean not far away from a pittoresque little town with boutiques and restaurants, a wide sandy beach, the sound of the waves. We could watch those waves and spectacular sunsets from the terrasse and we loved it. The house has everything you need and we enjoyed the cozy atmosphere. We will definitely come back!!! This year we spent the first week of September in house nr. 9. All the pictures describe the house and the surroundings exactly as it is. We enjoyed the long walks along the beach, whether it was in the morning or in the evening. There is a good bakery only a hundred meters away where you can have all kinds of bread, delicious french tartes and all kinds of coffee, espresso etc. There are several places in walking distance where you can have lunch or diner. When you want to prepare your diner yourself, don’t forget to go the market in Soulac sur Mer, which is only 4 km away and you can buy her everything, fresh fish, meat and vegatables. But don’t forget to ask Nico for good and affordable Bordeaux vines. He is also perfect in organizing visits to important vineries (Chateaus) in the Bordeaux area. A delicious diner in the evening during sunset and a glass of good Bordeaux vine is really all you need to be happy. The beach house is simply furnished, with basic amenities (the pictures say it all) and is in keeping with the back-to-nature setting on the dunes. Great for admiring the spectacular sunsets. Genau da hatten wir uns immer gewünscht. Ein Haus direkt am Meer, jeden Abend Sonnenuntergangs Kino und das beruhigende rauschen des Atlantiks, dazu einen leckeren roten Medoc.....Zum Frühstück kann man das berühmte Baguette gleich um die Ecke kaufen und unter dem Arm geklemmt nach Hause tragen. Die Restaurants bieten gutes Essen, frische Huitres und Fruits de Mer gibt es überall. Den Tag haben wir mit endlosen Spaziergängen am Sandstrand verbracht oder mit einer Tour mit Weinprobe im Medoc. Bis zum schönen Bordeaux ist es auch nicht weit wenn man Stadtluft atmen will. Wir hatten wunderschöne 2 Wochen und kamen relaxt nach Hause. Das Haus ist für 2 Personen optimal, die komplette Küche hätten wir nicht gebraucht da wir immer auswärts essen waren - in dem bequemen Bett mit dem Meeres rauschen und dem Blick auf den silbernen Mond über dem Meer haben wir geschlafen wie die Murmeltiere. Ein liebliches Haus in wild-romantischer Natur. Wunderschöne Sonnenuntergänge direkt von der Terasse aus machen süchtig. Früh morgens kann man am Strand wunderbare Spaziergänge Richtung Soulac unternehmen und die aussergewöhnlichen Lichtverhältnisse des Sonnenaufgangs geniessen. Das Haus bietet alles was man braucht. Tolle Restaurants sind gleich um die Ecke. Morgens gibt es wunderbare Croissants frisch vom Bäcker. Auch die Umgebung ist sehenswert. Einschlafen mit dem schönen Geräusch der Brandung...Wir haben den Aufenthalt sehr genossen und hatten das Glück das Nachbarhaus ebenfalls nutzen zu können. Für Geniesser der guten Küche und der Natur ist dieses Haus absolut empfehlenswert. Ende März sind wir dem deutschen Winter entflohen. Abends in Amelie angekommen waren wir beeindruckt von der Nähe zum Meer, die Brandung war einfach nur klasse! Das Reihenendhaus liegt sehr ruhig auf einer Düne und man hat einen wunderschönen Blick aufs Meer. Wir konnten auf der Terrasse die warme Sonne genießen. Man kann lange Strandspaziergänge machen, in Soulac (4km) einkaufen oder flanieren. Das Haus ist in einem gepflegten Zustand, gut eingerichtet. Die Vermieter sind sehr freundlich, hilfsbereit und unkompliziert. Wir können das Haus nur weiterempfehlen. From boulevard de l'Amelie drive past Hotel des Pins to the Chapel and turn right at stop sign. Turn at first left past sign for Camping Amelie-Plage. Turn into second drive on the right into parking lot for Residence le Moana. Rental fees include all costs such as taxes, electricity, water, parking, towels and linen, Satelite TV, W-lan Internet and Telephone calls to European and North American land lines.